Charly pursues in picture framing a love for the discipline of craft and the preservation of ephemera. While earning a BA in Anthropology from UC Santa Cruz, Charly focused her studies on culture and the studio arts. Interest in history and design led her next into the world of antiques, where she specialized in vintage and antique posters. While working for Berkeley-based Vintage European Posters for seven years, Charly managed the linen backing and framing of the collection, all the while deepening her appreciation of quality design and the culture of small business. 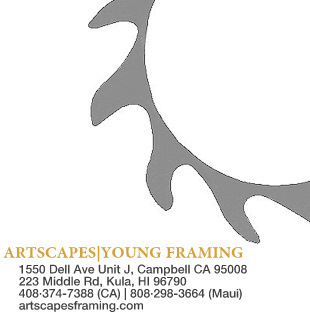 In 2013 Charly joined Artscapes’ Master Framer Glenn Young on the island of Maui for a traditional framing apprenticeship. She was able to draw on his more than two decades’ experience framing and preserving the collections of some of the Bay Area’s top museums, as well as the art of countless individuals. The thriving art scene of Maui provided endless opportunities for Charly to practice museum-level work, while continuing her aikido practice and fostering a love of surfing. Now back on the US mainland, Charly heads Artscapes’ North Bay outpost, with a workshop in Cotati and the ability to meet with clients throughout the Bay Area by appointment.